Hey this is for those who love potato chips and contest fans. 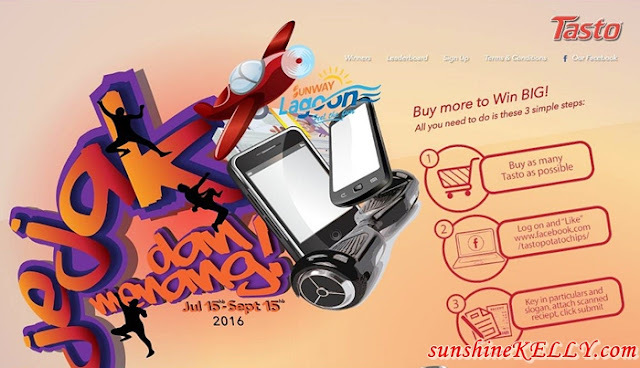 Join Tasto Jejak dan Menang National Contest from 15th August till 15th September, 2016. You can kill two birds in one stone, not only you are munching the crispy and flavourful potato chips but at the same time you stand a chance to win up to a total of RM13,000 worth of cash and prizes. 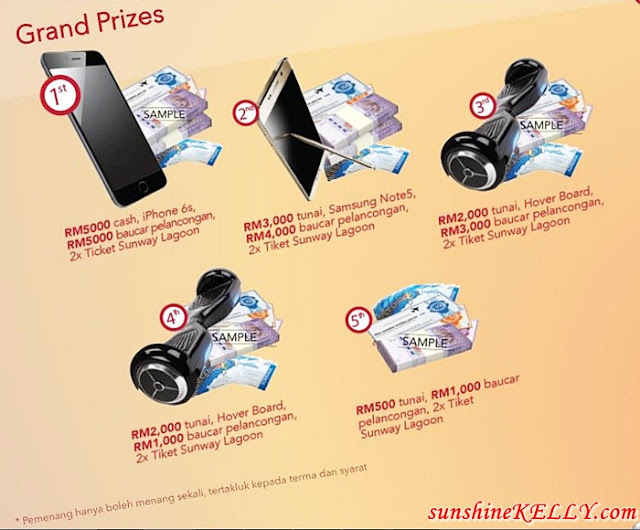 There will be 220 prizes to be won such as iPhone 6s, Samsung Note 5, Hover Boards, Travel Vouchers and many more. 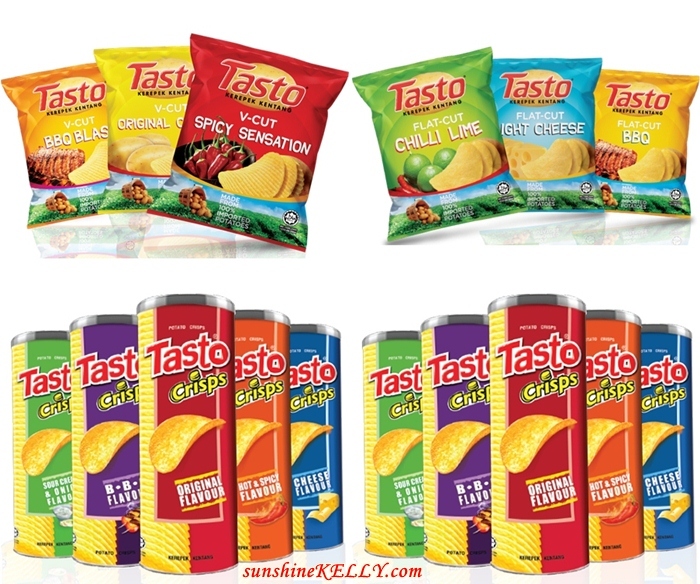 Have you tried Tasto Potato Chips before? Here I have tried these, can you guess which one is my favourite? Hmm… actually I love all of them but you know that me as a spicy food lovers, of course my most favourite is the V-Cut BBQ Blast. I love the moderate smoky bbq flavour and the thinly v-cut yet firm texture that give a crunchier. It’s so addictive. However the V-Cut Original Crunch is best for all when it comes to picnic, parties or movie night out with the whole family or friends. Tasto Crisps in canister packaging of 110g which is so convenience and comes in 5 different flavours; the original being the core flavour besides the sour cream & onion flavour, hot & spicy flavour, bbq flavour and cheese flavour. I like the sour cream and onion flavour that is so crunchy and well blend of flavour give the explosive sensation in every bite. Tasto Flat-Cut Light Cheese is the thinnest among the 3 types and it’s so crispy. The lightly cheese flavor give is creamy finishing and comfort. For the Flat-Cut there are 2 more flavours such as Chilli Lime and BBQ. 3. Click Jejak dan Menang 2016, go to Sign Up and key in your particulars, write your most creative slogan slogan in less than 15 words and attach your scanned receipt as proof of purchase. Then click submit. Here are the Grand Prizes and the winner will be determine by the most creative slogan while contestant with the most purchases will win the weekly or monthly prizes. Each contestant may only win once. There will be 10 Grand Prize Winners with the most creative slogan and the prizes are really awesome. Great contest.. The prizes are amazing.. Let's take part.. I've not heard of Tasto before, so I hope that I can find them in Ipoh. Want to win that phone! I like V cut ones very much, okay, list it in my next grocery shopping! OK. I'm gonna head to the stores and buy them chips! Wanna win big! Such a great contest! Those prizes seem tempting! Looks like a fun contest and as always, when eating chips as snacks, eat moderately! I say that because in my case, sometimes, I end up finishing a pack when I should not! LOL! wish i can win this! seems like a great event! yum yummmm...the chip look so good!! !greatttt one! I love this brand. Crispy and tasty. My favourites are the vcut ones! Nom nom!